Laparoscopic surgery for pancreatic disease has gained increasing popularity. A laparoscopic distal pancreatectomy is technically simple and has been adopted as the preferred method in many centers. However, there is limited information on the outcomes of the laparoscopic surgery compared with open surgery. 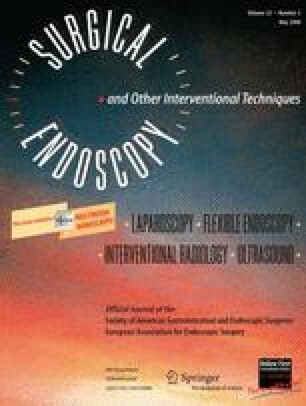 Therefore, this study aimed to investigate the clinical outcomes of laparoscopic distal pancreatectomy and to evaluate its efficacy compared with open distal pancreatectomy. From February 1995 to March 2006, 31 patients underwent laparoscopic distal pancreatectomy, and 167 patients underwent open distal pancreatectomy at Seoul National University Hospital and Bundang Seoul National University Hospital. A case–control design was used with 2:1 matching to compare laparoscopic surgery with open surgery. Among 167 patients who underwent open distal pancreatectomy, 62 patients whose age, gender, and pathology were similar to those of patients who underwent laparoscopic surgery were selected for this study. The operation time, intraoperative transfusion requirements, duration of postoperative hospitalization, complications, mortality, recurrence, and hospital charges were analyzed. There were no significant differences in operation time, rate of intraoperative transfusions, complications, recurrence, or mortality between the two groups. Laparoscopic distal pancreatectomy was associated with a statistically significant shorter hospital stay (11.5 days vs 13.5 days; p = 0.049), but with more expensive hospital charges than open distal pancreatectomy (p < 0.01). Laparoscopic distal pancreatectomy is a clinically safe and effective procedure for benign and borderline pancreatic tumors. This study was supported by a grant from the National R&D Program for Cancer Control, Ministry of Health & Welfare, Republic of Korea (No. 0520320).